JH is so sweet and Anna is so funny. JH spells better than some adults I know. LOL! I am glad you are having a baby too! Give the family a hug and kiss for me. See ya Christmas! Love ya! Loved the note John Henry left you!! Appreciate you, love your folks, very thankful for them! Love my family and friends too!! Have a great turkey day! So Sweet!! You should frame it! I have all my notes, cards, and things my boys made me hanging in my walk-in closet where I get ready so that I can look at them everyday. Mine are older now so I don’t get too many notes (haha) but I cherish the ones I have. Have a very Happy Thanksgiving!! Love you guys! 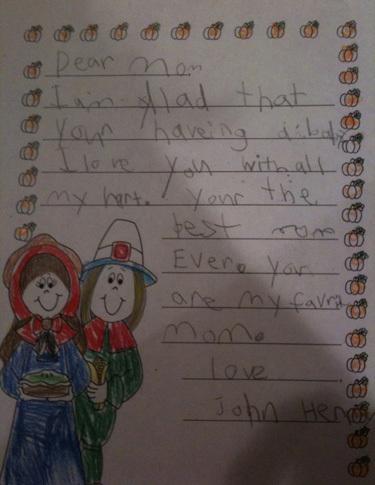 Yes, crying again… lol Dusty, you ARE the best Mom ever and you ARE my “favrit” too. I am so thankful for my beautiful family, a wonderful daughter who is a beautiful inside as out, an awesome Son who loves his family with all his heart, and 3 incredible grandchildren, 1 who is my “heart”, 1 who is my “joy” and the 3rd who is my “life”! I AM so blessed!